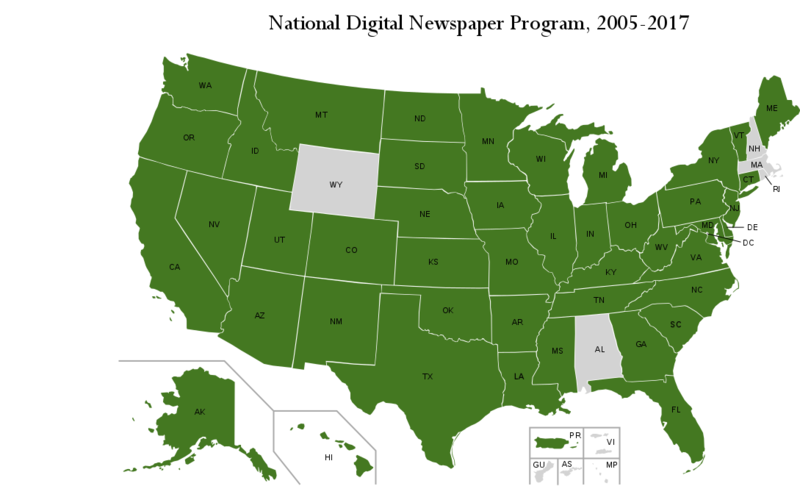 In 2014, the University of Nevada–Las Vegas (UNLV) University Libraries were selected to participate in the National Digital Newspaper Program (NDNP), a partnership between the National Endowment of the Humanities (NEH) and the Library of Congress (LC). The program is a long-term effort to provide permanent access to a national digital resource of historic newspapers published between 1836 and 1922, selected and digitized by NEH-funded institutions from all U.S. states and territories. Digitized newspapers are made available on the Chronicling America website, hosted by the LC. Each state that is awarded the NEH grant selects, digitizes, and delivers 100,000 pages of historic newspapers to the Library of Congress. Currently, there are about 8.1 million pages of historic newspapers from almost every state and territory. UNLV is working in conjunction with the Nevada State Library and Archives (NSLA), the University of Nevada–Reno (UNR) Knowledge Center, and a broad support of stakeholders across Nevada.